This Web Log has been created with a view to be the first advice stop for people living in the Turramurra area of Sydney. As issues concerning the are arise it is our wish to make the locals aware of such things. An important strategy for organic gardeners is to enhance and maximise the natural biological controls already present in a garden ecosystem. Does your garden provide a nectar source for beneficial, pest-controlling insects? 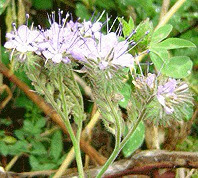 Planting particular flowers and herbs known as insectary plants has been proven to improve the natural balance and reduce pest outbreaks. The Zeal group provide a Good Bug Mix containing colourful re-seeding annual and perennial flowers including red clover, alyssum, cosmos, marigolds, Queen Anne's Lace, buckwheat, lucerne, dill, caraway, coriander and phacelia (when available), gypsophila. It blooms much of the year, providing nectar, pollen and habitat for wild and introduced beneficial insects, such as predatory mites and tiny micro wasps, ladybirds, lacewings, hoverflies, tachnid flies and predatory beetles. These beneficial insects or 'good bugs' are generally small with correspondingly small mouthparts, so they are only able to feed on particular flowers with suitable attributes. By providing a plentiful food supply the 'good bugs' live longer and reproduce more. As well as a good ground cover to keep your weeds down in garden beds. Sydney has become " tones of Green centric", which is only good forbad bugs. So for the love of God Sydney wake up to color and get good bug friendly in your gardens. Flowers also provide a food source for honey bees. You can find information on growing bee forage here. 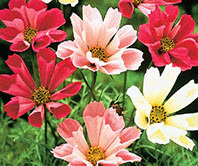 'Sea Shells' is a beautiful cosmos, the rolled, tubular petals are unusual and are thought to look like sea shells. It blooms in shades of pink, red and white; a good background plant that grows over a metre tall. Feathery foliage fills plants in from top to bottom creating a bushy look. A native of Mexico, it prefers a sunny position with protection from wind. Also useful in the orchard as a bee forage and nectar source for beneficial insects. Suitable for temperate and subtropical areas. 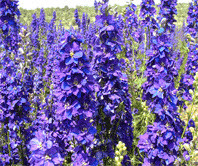 Larkspurs are tall annuals (1 - 1.5 m) with finely cut feathery foliage and double blue flowers Tall flower spikes are produced in early summer that are excellent for cut flowers or the back of garden beds. Sow seed in autumn, it requires a cool temperature (13°C) to germinate well. 'Miss Jekyll Indigo Blue' is a frost-hardy, annual cottage garden plant with rich, indigo blue, starry flowers nestled in fine foliage. It can be used as cut flower and lasts 7 to 10 days in a vase; the seed pods can also be dried. 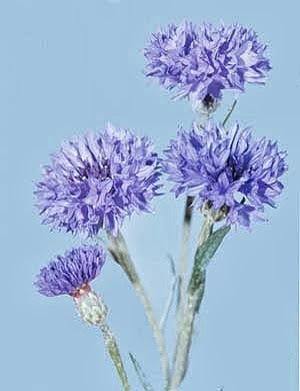 It is upright and fast growing, 40 to 60 cm high with a spread of 20 cm. It is attractive to bees and beneficial insects. The seeds were once stored with clothing and believed to repel insects. It prefers to grow in full sun in a rich, well-drained soil. If seed pods are left to develop, then self-sowing is common the next year. Sow late summer to early autumn in temperate and subtropical areas. 'Fiesta' is a French marigold with dark tawny red and lemon bi-coloured flowers that bloom for a long period and will brighten any garden. Use as an edging along garden beds or in pots. 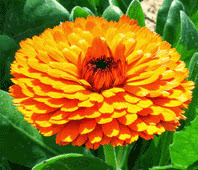 Marigold petals are edible and can be used to decorate salads. 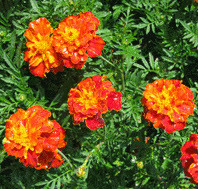 'Sparky' is a French marigold mix of tawny red and gold bi-coloured flowers that bloom for a long period and will brighten any garden. Use as an edging along garden beds or in pots. 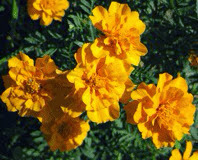 Marigold petals are edible and can be used to decorate salads. 'Jewel Mix' has sweetly scented flowers in yellow, orange, salmon and deep red that bloom for a long period. Leaves are lily-pad shaped and bright green. A wide range of uses include: ornamental in hanging baskets; as a hardy groundcover under fruit trees; as a salad leaf with a tangy, watercress-like flavour; as an edible flower or garnish; as an edible seed used as a ‘caper’ substitute. Sow spring and summer, autumn in frost-free areas only. Suitable for temperate, subtropical and tropical areas. A Victorian heirloom flower with vibrant, long spurred, crimson-scarlet flowers that stand out against the dark blue-green foliage. Plants are compact and suitable for containers and hanging baskets. A wide range of other uses includes: as a hardy groundcover under fruit trees; as a salad leaf with a tangy, watercress-like flavour; as an edible flower or garnish; as an edible seed used as a ‘caper’ substitute. Sow spring and summer, autumn in frost-free areas only. Suitable for temperate, subtropical and tropical areas. Annual cottage garden plant to 1.5m, lacy white flower head; attracts assassin bugs, lacewings, predatory wasps; self-sows; great for orchards and garden edges. Sow spring, autumn (frost tolerant). Suitable for temperate and subtropical areas. 'Evening Sun' has beautiful, large flowers in autumn shades of orange, russet-bronze, mahogany-red and gold with dark centres. The multiple heads provide an extended bloom period. A great variety for cutting; the plants grow 1.8 - 2.4m tall. 'Cosmic Flame' is a single head, fast maturing sunflower that makes a great addition to the summer flower garden. The flower head is very striking with rich, deep golden yellow petals with a dark, contrasting centre. The plants grow 1.2m tall. This is an F1 hybrid so is not suitable for seed saving. 'Sunbird' produces a large, grey-striped sunflower seed which is excellent as human food or poultry forage. Sunbird is both drought tolerant and disease resistant. The plants grow 2 - 2.5m tall. Sweet smelling clusters of tiny flowers, ideal as a groundcover, trials in the USA prove this to be an extremely useful insectary plant; no organic garden should be without it! It is frost and drought tolerant. Sow spring, autumn in warmer areas. Suitable for temperate and subtropical areas. ‘Subspecies benthamii’ is a hardier, more vigorous form of alyssum used mainly for its ability to attract beneficial insects to cropping systems. It is sown in the inter-row spaces of vineyards and orchards and as a row between crops in vegetable market gardens. 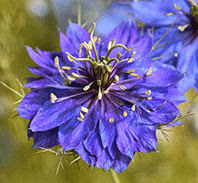 It is easy to grow, drought tolerant, and it will self-sow readily and flower over a long period. Use 1g of seed per 2m2 (2500 seeds/g). Sweetpeas are a beautiful annual fragrant flower for the cooler times of the year. It is suitable for temperate and subtropical areas. There are both dwarf and climbing types. 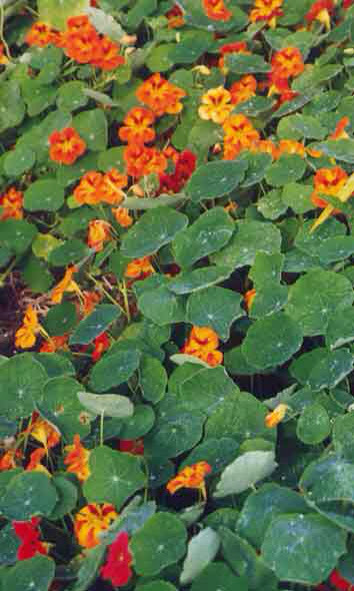 Usually the climbing types are less prone to mildew and flower over a longer period. Generally if it is the right time to plant peas then same goes for sweetpeas. Sow seed in early temperate and subtropical areas. The best germination soil temperature is between 4.5 - 21°C. Germination will take 6 - 14 days. Seed should be soaked in water 12 - 24 hours before sowing. Sow direct into garden bed to 2 - 2.5 cm deep. Space seeds 8 cm apart along the row. Lightly mulch seed rows to prevent crusting. Choose a position in full sun, sheltered from wind. Soil should be rich, fertile, well drained, with a pH of 6.5 - 7. Lime if necessary several weeks before sowing. Improve the soil before planting by adding compost. Once in flower remove spent flowers and young pods to prolong flowering. Pick early in the morning as a delightful cut flower. 'Mammoth Choice' is an early-flowering, highly productive, climbing sweetpea. Large, fragrant blooms in shades of lavender, blue, rose pink, salmon pink, white and burgundy are borne on strong stems. A beautiful addition to any flower garden and wonderful as a cut flower. It withstands heat and drought unusually well. It is a climbing variety 1.5 to 1.8m so a trellis is required. Zinnias are hardy, summer flowering annuals from America. ‘Red Beauty’ has very large, 11 cm across, brilliant, dark red, dahlia-like blooms on strong stems 50 - 60 cm long. It is an excellent cut flower. Flowers are long lasting both in the garden and vase. Disease resistant plants.